Full size bed w/bedroom furniture set that includes a chest of drawers & vanity w/bench. The set has been custom hand painted with a trompe l'oeil (fool the eye) touch. The footboard has a Victorian ice skating and winter scene, with ice skaters on a frozen pond and a horse drawn sleigh. 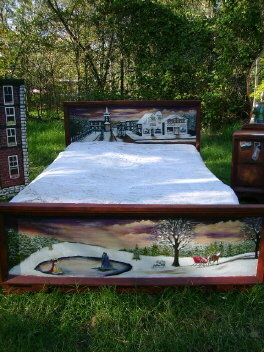 The headboard has a Victorian winter scene of a city street, shops, horse drawn carriages and brick buildings. 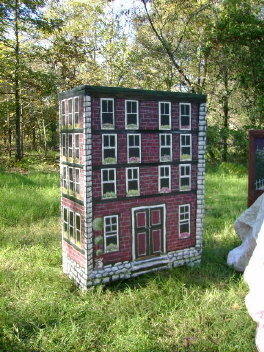 The 5 drawer chest is painted to look like a tall brick building. The vanity has a envelope, silver comb w/mirror painted on the top and a black stocking hanging from the drawer. 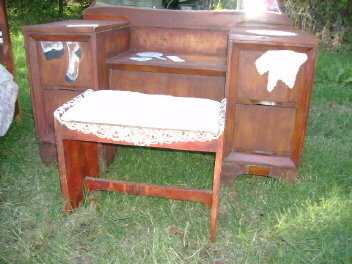 It also has a lace hankie in the drawer and a Battenburg lace doilies painted on the top of the vanity. The bench has matching Battenberg lace painted down on each of the bench. Everyone has to touch the lace, they don't believe that it is painted. The top of the bench is covered with white fabric and Battenberg lace. 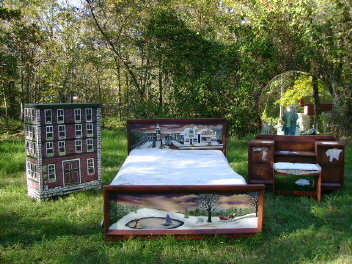 The set includes: full size headboard, footboard w/rails, bench, vanity w/large mirror & a 5 drawer chest of drawers. The chest is 34 " x 48 " & 17" deep. The vanity is 50 " wide. I usually use Greyhound Express on the larger furniture items to keep shipping costs as reasonable as possible. Everyone has a fit over this bedroom set, even the men ! If you have any questions, just send me and email. Items Similar To "Vintage Bedroom Set Victorian Handpainted Trompe l'oeil "